We have all experienced feelings of not belonging. This can be disconcerting, since the need to feel part of a group is a primitive one. Historically, humans as social beings have increased their chances of survival in tribes and collectives rather than existing alone. Today, modern humans display a range of variance in terms of social preferences. Extroverts relish the opportunity to meet new people, while some of us are introverts who are misunderstood as shy. Introverts can be very social, preferring extended conversations that engage their brain with likeminded people. Introverts tend to have fewer, yet loyal friendships as compared with the classic extrovert (with broader social networks and degrees of superficial to deeper relationships). Extroverts may accommodate readily to new social situations, but introverts are simply more selective about how they interact in the world. Be Curious. You’ll find the experience of meeting new people more interesting and effortless if you behave as if you are interested in what others have to say. Make the conversation two-sided by inviting them into your world. Make eye contact rather than looking to the side or down. This will let the other person know you aren’t distracted by other things. As they continue to engage with you, ask questions to peak their interests. “So, when I’m not working with Ted, I’m pretty involved in my kid’s soccer team as a volunteer coach. Are you involved in any school functions?” They may not have a “yes” for every question- the point is, you asked them. They are likely to offer up something they are interested in (you’ve opened the door), even if it is unrelated to the question at hand. Steer the focus of conversation to what they like talking about. Work with the information they’re giving you. You’ll soon find you don’t feel uncomfortable at all (heck, you’re having some fun at this!) and the conversation requires less effort as you go. If the conversation isn’t going well, or the person suddenly says, “Excuse me, I have to make a call,” don’t despair. It is ok (and expected) that you won’t click with everyone. Value Differences in Yourself and Others. Unfairly comparing yourself (usually negatively) to others can keep you from feeling comfortable in your own skin. Comparisons can lead to negative self-talk and keep you feeling inadequate. “I’m so fat compared to her. She wouldn’t want to talk to me.” This negativity is only going to maximize your feelings of discomfort with self. “He’s got a very expensive looking blazer. I should have worn a nicer sweater. He’s thinking I don’t know how to dress.” Stop yourself from making automatic assumptions that others are noticing the same things you are, or passing judgment on you. If they are indeed making the negative judgments that you imagine, it indicates they are fairly superficial and egotistical. Consider yourself lucky you don’t click with them. Find joy in your own uniqueness. Mediocrity (who wants to be average?) comes from feeling you are just like everyone else. Give Your Own Perceptions the Weight They Deserve. Purposely and strategically consider the evidence for your negative thoughts when you feel uncomfortable. Deliberately acknowledge these thoughts (“I didn’t prepare enough for this meeting.”) This thought now requires you to raise your level of consciousness and analyze yourself. We may not have all the facts about Mark’s preparation time, but the revised observation IS based on your own experience. You refused to unnecessarily beat yourself up anymore during the meeting AND you are being true to your own observations. Moving past discomfort requires us to make an effort with others and ourselves. Just as we’d like others to positively respond to us, we need to do the same with others. We can’t always predict how others will act, since we don’t know their experiences and what they are taking in. The point is to reach out to others, acknowledge our differences, and rely upon our own assessments as valid. 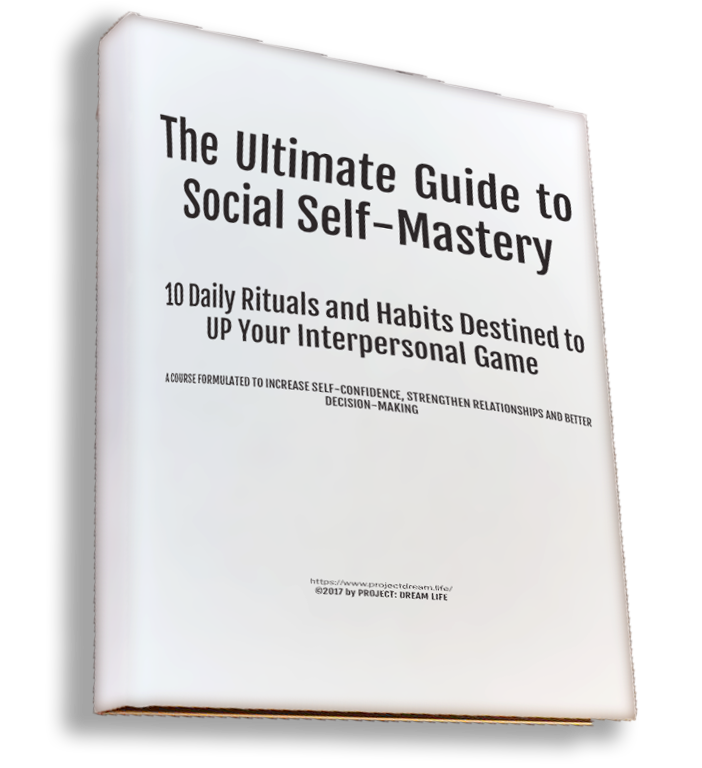 FREE Bonus Download: Ultimate Guide to Social Self-Mastery eBook! IT'S an ebook course FORMULATED TO INCREASE SELF-CONFIDENCE, STRENGTHEN RELATIONSHIPS AND help you make better decisions. We will send you an email confirmation with additional details.